Making your own bridal bouquet isn’t as difficult as you might think and it’s a great way to add your own touch to your special day, while also saving money. You can make a simple, dome shaped bouquet in about 30 to 60 minutes with just a few basic items. This bouquet uses just a single flower variety and will look great with any theme or style of wedding gown. Be sure to select a flower that’s not too delicate so it will survive the assembly process. Roses are an excellent choice or you can also opt for silk flowers. Building your bouquet starts with removing any thorns (if you’ve chosen roses) and any other foliage from the stems. Check your flowers and remove any petals that don’t look perfect. Fill a bucket or sink full of water and while holding stems under water, make a slanted cut about two inches above the ends of the stems. Let the stems remain in the water for a few minutes to soak up some water, then place them all in a container of cool water until you’re ready to start working with them. Here’s a tip if your working with roses: If the blooms haven’t completely opened up, you can speed up the process by standing them in a bucket of warm/hot water for just a few minutes. You want to do this right before you use them, otherwise you run the risk of killing them. You’ll want to be sure and keep all the stems as is to begin with. You can trim them to the right length once you’ve completed the bouquet. Now you’re ready to start putting your bouquet together. Begin by putting together four flowers into a square shape, all at even height. This will be the centre of your bouquet. Then add in the rest of the stems, one by one, around this centre to build your bouquet. It might be helpful to work with a mirror in front of you so you can get a good idea of how the bouquet is taking shape. Once you’re happy with the shape of your bouquet you’ll need to secure it with the floral tape about 4 inches below the heads of the flowers, or where the stems seem to naturally join together. Secure them again toward the end of the bouquet and leave 2 inches exposed that you can trim them later. Once this is done, you’re ready to move to the next step. If you can’t proceed, be sure to place the flowers in water until you’re ready to move forward. Now you’re ready to wrap the bouquet with your ribbon. Once you’ve cut the stems to the proper length, about 8 inches, dry them off with paper towels. You’ll need a strand of ribbon that’s about 3 times the length of your stems. Start wrapping by first tucking the end of the ribbon into the binding at the top, and wrap it around the stems in a spiral pattern. Once you’ve reached the bottom, reverse the process and, using the same spiral pattern, wrap the ribbon back up to the top. Tuck the end into the binding. Now you’re ready to secure the ribbon with either your straight pins or corsage pins, pushing the pins through the ribbon and the stems. At this point you can add a bow if you choose, tying it just below the flowers. To preserve the bouquet, wrap it in tissue and place in in the refrigerator until it’s time to head to the ceremony. 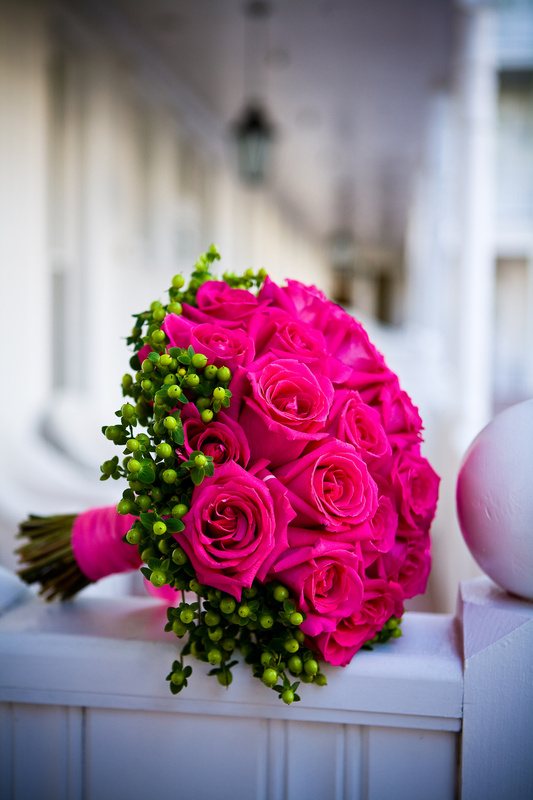 For the best results, it’s a good idea to make your bouquet on the morning of the ceremony. Category DIY Flowers | Tag bridal bouquets, diy bouquets, do it yourself bridal bouquet | Bookmark the permalink.